The electromagnetic flowmeters are used in the paper industry, water management, chemistry, metallurgy and other industries. 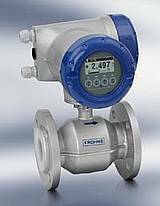 We have extensive experience with applications of magneto-inductive flowmeter OPTIFLUX 4300 Krohne, which is suitable for measuring the flow of conductive liquids, acids and bases, even in difficult applications such as media with low conductivity, a high content of solid particles or gas bubbles, homogeneous, abrasive and corrosive media. It is used in applications in which there is a rapid alternation media in pipes, sudden changes in pH and pulsating or turbulent flow.